It’s December and the end of the year is fast approaching. It’s often a time to reflect back on the year past and to look ahead to the following year. Both of these activities are really good things to do but we can get it wrong! We can get our brain stuck in an endless cycle of negativity by focusing on the wrong things and the happy task of reflecting can become a miserable one. December always seems to be a busy month! Trying to fit everything in before taking time off for Christmas can be a struggle. 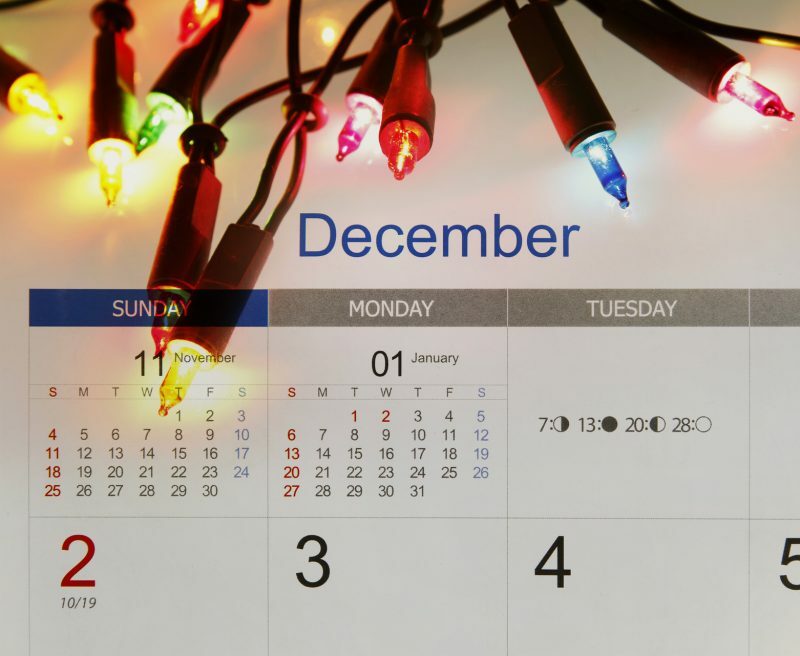 There seems to be a lot more to do than a normal month and a strict deadline to get it all done by. If we’re not careful the lead up to Christmas can be a stressful one. And that can cause bigger problems that you might at first realise. When we’re stressed our primitive brain can take over from our more rational, sensible brain. Our primitive brain isn’t really very clever at all and it mistakes the stresses of a busy festive season for more primitive threats, like an attacking lion! I know, it seems daft but our primitive brain is exactly that – primitive. It doesn’t understand our modern lives so it views our pre-Christmas stresses in the only way it can – as life threatening situations that it needs to either run away from or stand and fight. And the problem when we’re in this part of our brain is that any reflection we do on the past year or plans we’re trying to make for next year will get sabotaged by a very negative way of thinking. Once our primitive brain has taken over it is only interested in checking out any potential dangers, if it isn’t a potential danger, it’s not interested and it doesn’t even register. Which means that when we scan back over the past year our brain is more likely to pick up on all the things that went wrong rather than remembering the good bits. And any plans we are trying to make for the following year will be beset by all the negative – “I can’t do this”, I’m not good enough” or the dreaded “What If’s”. What if this goes wrong, what if I get the sack, what if I can’t earn enough money, what if I’m not good enough, what if, what if, what if…. When our primitive brain is in charge it’s very much like watching the 9 o’clock news – it is only reporting on the bad things that are happening and we end up with a very skewed view of our lives. Suddenly it seems like the whole year was a tough one with lots of things going wrong, and we have forgotten the days out, the weekends away, the good exam result, the night out with friends. So, as you can see, it’s very important for us to make sure we’re in the right part of our brain when we are reflecting and planning. Because when we are it’s a totally different experience! When we’re calm and relaxed and not feeling so much overwhelm our more sensible, rational, intellectual brain is in charge. And this part of our brain has a much more balanced view of our lives. It will see the good and the bad and weigh them up together. So we might acknowledge that we’ve had a challenging year but we’ll reflect on how well we dealt with it alongside remembering the fun, happy times; we’ll learn from our experiences, decide what we’d do differently and be on the lookout for opportunities to replicate positive experiences and avoid negative ones. We might recognise that we’ve set ourselves an ambitious goal for the year ahead but we’ll see that, with some hard work we’ll be able to achieve it and we find ourselves taking actions to help ourselves. As hypnotherapists we know that taking back control from that kind of thinking can be simple, but we also know that simple doesn’t necessarily mean easy! And that’s why it’s one of the first things we teach people, how to take back some control and shift your brain’s focus away from the negatives towards the more realistic, balanced view where reflecting on the past is a joyful experience and looking ahead to the future fills you with excitement rather than overwhelm. We’ve compiled our favourite Top Tips to help you do some positive time travelling – check out our blog here…. If you’re finding it difficult to see the positives in your life it may be time to contact your nearest Inspired to Change hypnotherapist to book your FREE initial consultation. Inspired to Change Hypnotherapists are based across the UK in Peterborough, Northamptonshire, Cambridgeshire, Leicestershire, Devon and Kent. PreviousInspired to Change – The Happiest Team in the UK!